Lately I have found myself addicted surfing Pinterest for cool ideas on stuff to cook, great sayings, crafts for the holidays, and sooo much more. Last week I saw this one, and today my friend Kim “repinned” it and even put it on Facebook. I have to admit, it TOTALLY flung a craving on me. I started my day with a crazy intense workout, so in hindsight doing this today was well… stupid. However, the project turned out so amazing, it kinda makes up for the fact that I am typing this barely able to move anything more than my hands. We have had an ongoing issue with a corner of our backyard. It is COMPLETELY covered, so literally almost zero sunlight reaches the ground, making it virtually impossible to grow any grass. 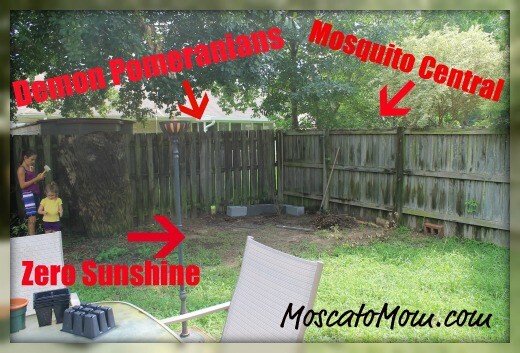 Plus on one side we have little rabid, possessed pomeranians that get their kicks out of taunting our dogs, and on the other side we have a wildly overgrown (yet beautiful, I will give it that) backyard housing several billion mosquitoes. 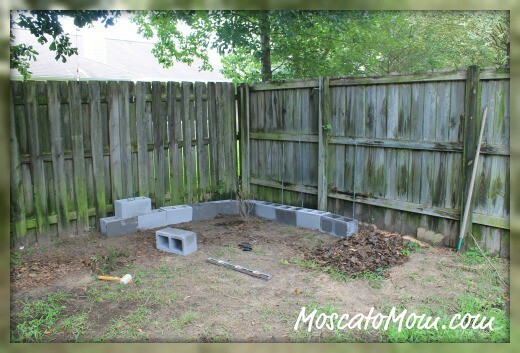 So I decided to basically BLOCK both of these nuisances with a Cinder Block Garden! Now, when I saw this on Pinterest, I Googled to find more, and well… I am going to give you the REAL D-I-Y on how to do this thing. Step 2: Lay out your first level to whatever the largest size you want. Since we were trying to cover a good bit of “the hell corner” I chose to go 5 double cinder blocks down each side. Stick rebar into the holes and use the mallet to pound them down at least 12 inches into the ground to secure… knowing full well you will probably rearrange them a minimum of five times. 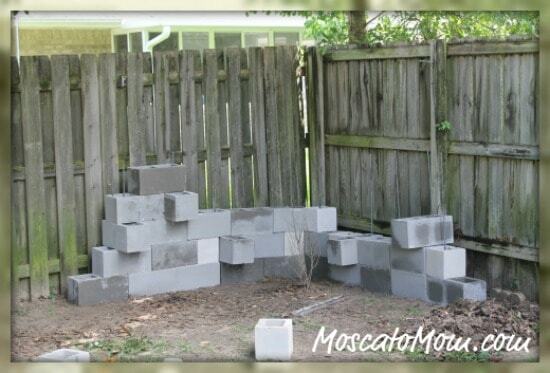 They should protrude out, as you will “thread” them through the holes of the rest of the cinder blocks for support. Step 4: Continue building upwards until you are happy with the results. Remember that random is the key to success here, and do not be overly fanatical about everything lining up perfectly or being symmetrical. Once you are happy with the results, use the mallet to pounds the rest of the protruding rebar into the ground to be flush (and otherwise hidden) in the cinder blocks. Step 5: Pour sand/dirt/soil down into each hole and pack it down as much as you can. This will be to further secure the structure, as well as for roots to grow from all of the little plants! I will be going back to Lowe’s to get the Children’s Sandbox Sand as I think that it helps ward off ants. Oh, even Indi loves it! 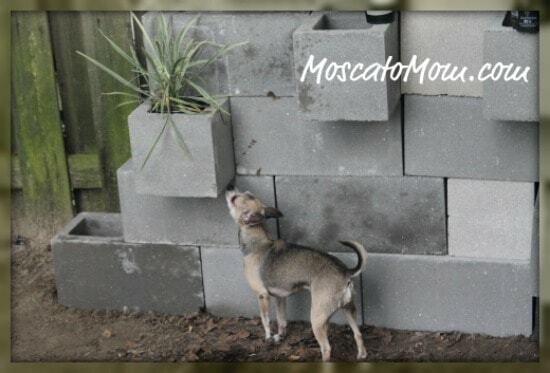 Tomorrow I will post how to make the little “planter baskets” to secure your plants in the protruding cinder blocks. All in all I have to say this is one of my most favorite DIY projects ever. From start to finish (well, of phase one) was about 4 hours. I love when I can have an idea, and within just a few hours have a finished product that I can show off and feel good about. It was a fun way to spend an afternoon with The Tween – she was a big help and we had a lot of good laughs – mostly at my expense, but it was still a great time. I would highly recommend this project to anyone wanting a unique, fun way to have a garden! Kim, I dont think it matters, since I planted annuals… they should look the same year round. This is so incredibly awesome! I’ve seen someone do decorating with them before, but this is really neat! What a great way to use that un-sun area!! Gorgeous! You’re hired; just fired my gardener, so you can come out & stay in the “spare” bedroom. We’ve got much better weather out here; its in the 90s, but hardly any humidity! and the beach (with fewer shark sitings) is only a 1/2 hour away! But who needs a beach when I’ve got the hot tub! Wow! That is so cool! Very unique and eye-catching. Great job with it! That is absolutely the coolest thing! I love how it looks but don’t envy having to work on that in the summer heat! That is so cool! What a creative idea! great question. because i reinforced it with the rebar, it is very stable. plus i filled it with sand, for extra support. i have decided to make it into a water feature now, so i will be reinforcing it even more. i just love it. I like the idea of using this along with a water feature. 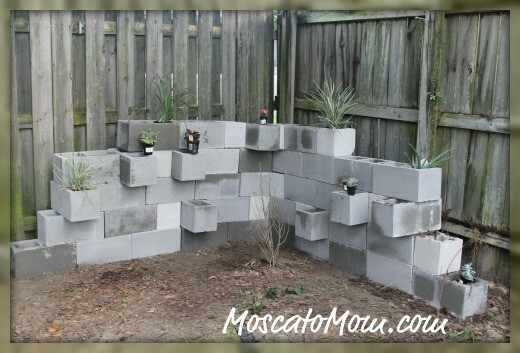 I am looking at putting in an above ground fish pond and want to use this cinder block planter idea to surround the pond. Would like to see pictures of how yours turns out! That is my plan for this summer – to put the water feature in! 🙂 Thanks for stopping by! I really like this! I’m impressed that you put it together so fast! Hey Susan! 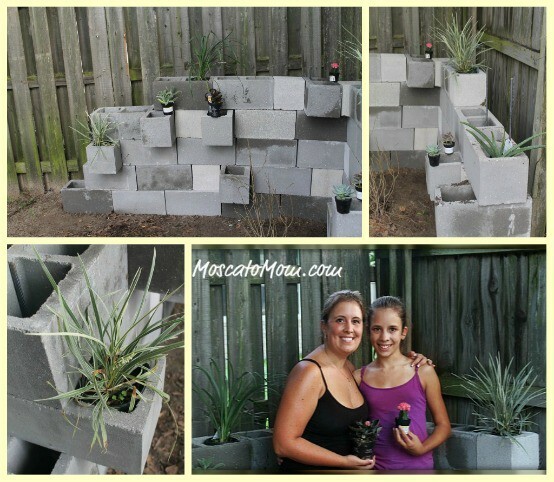 We actually ended up keeping the succulents in the larger pots and setting them directly into the holes in the blocks. I didnt have a rotor hammer (I think thats what it was) to nail the basket into the cinderblock – plus I was pretty sure I would crack them. We like that we can move stuff around – which is great for the seasons – helping some stuff get morning sun, and some get afternoon sun. 🙂 We also rearranged ours to the deck and made it more of a “double decker” and stacked them in a way that the open holes would have a closed block beneath it – basically giving it a bottom. We still prefer just using the pots. You can not see them at all! Hope this helps! I would love to see a picture of yours!